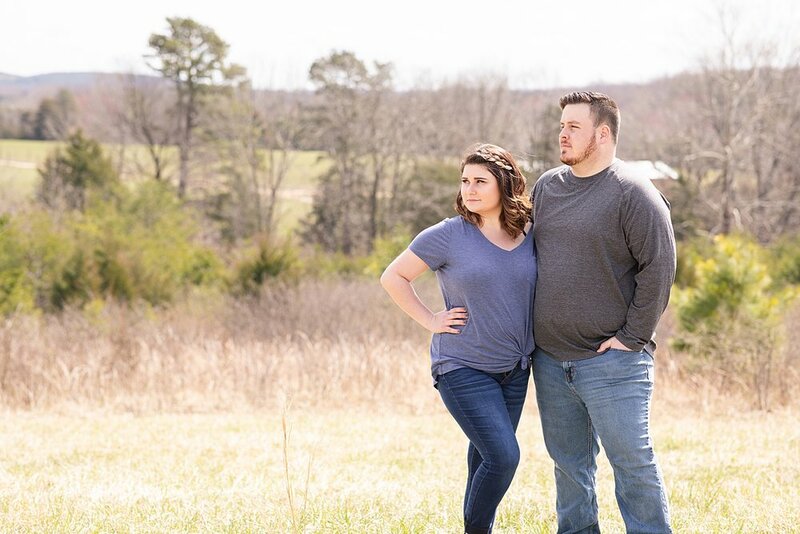 This was definitely a memorable engagement session complete with a sweet couple, their adorable chubby cheek kiddo, and my new photography assistant London. I love it when my couples have a “secret location” in mind for their engagement session!! I say secret because it was Derrick’s family farm! The views of the Mountains are STUNNING so as soon as we pulled up to their house I knew why Kayla chose this spot. I can’t imagine how beautiful this view is in the fall!! I have known Kayla and Derrick for about a year now and I was honored to be one of the first vendors she booked for her da. I have worked closely with Kayla through the Coiffeur Collective Hair Parlor and Studio. She has actually seen me work with my other brides on their wedding day so I am so honored she wanted to work with me for her big day! 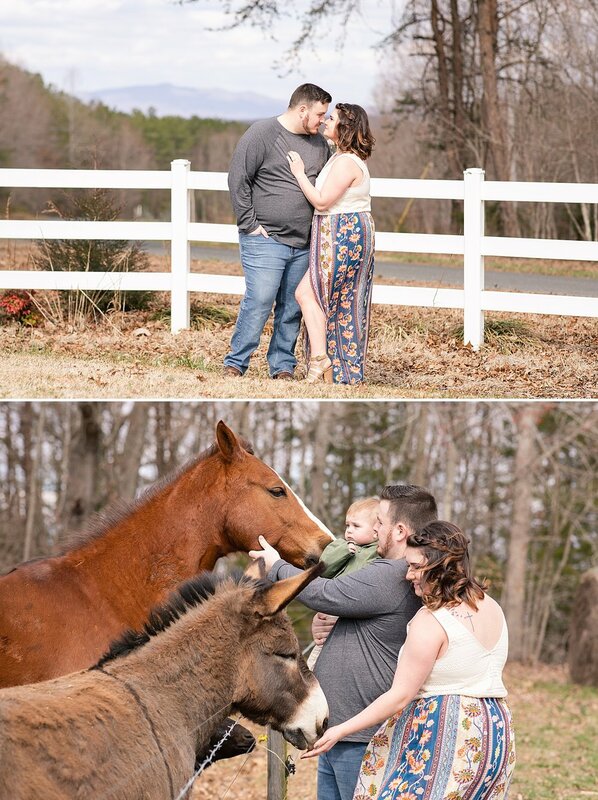 We only took photos at a few spots on the property but they did such a great job with all the different poses we didn’t need anything else! I couldn’t get enough of Kayla’s flowy romper! The wind caught it so beautifully and gave her look such a soft feminine touch! Derrick kept Kayla laughing the entire session! He was so good at “the nuzzle” except when I told Kayla to give me her model look. He would whisper something in her ear that made her laugh which ended up being adorable so I couldn’t complain!! Sweet little Oliver made in a few photos too! He refused to smile in half of them. I tried all the little noises and games that I knew to make him smile but I was not successful! His momma and daddy figured out what would make him smile and we got a few photos with his chubby cheek smile. He was not fond of the animals which I can understand since they are all so much bigger than he is!! I absolutely loved this session on Derrick’s family farm and was told by his family that I can come back any time for photos! How sweet is that??? I may take them up on their offer because this is a beautiful hidden gem in Concord, Virginia. This was the look I got most of the shoot but he is still a cutie! London!! Yes, London is a goat. This sweet goat followed us around and always ended up at my side! So I just made her (or him… I can’t remember) a part of the team! I will share more of these photos with my goat friend this December in my “behind the scenes at engagement sessions” post. I just love her model look and that flowy romper!! I kept scaring these fellas walking around the property… sorry little ducks! James always finds the coolest spot for his ring shots. Copyright © 2019 Emily Hancock Photography. All rights reserved.